On June 5 at 7 p.m., Maryland University of Integrative Health held its 2017 Commencement. 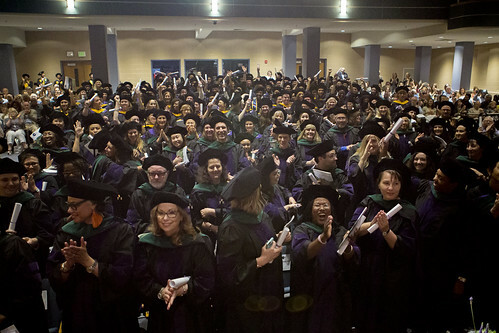 During the evening ceremony, 411 new healers celebrated their graduation and prepared to enter the professional world of health and wellness—our largest graduating class yet! This year MUIH also conferred its first-ever doctoral degrees in the fields of acupuncture, Oriental medicine and clinical nutrition. Before hundreds of friends and family, candidates assembled in the Jim Rouse Theatre and Performing Arts Center in Columbia, MD. Throughout the evening’s inspiring speeches, a theme of transformation emerged. All of our speakers emphasized that our graduates are embarking on a new journey from a place of authenticity, and that they should embrace their roles as healers and catalysts for change. President Steven Combs, in his first commencement address at MUIH, greeted the graduates and encouraged them to “bring your highest self into your work every day and to live into your role as an agent of change.” Watch Dr. Combs’ address here. Read Dr. Combs’ full address here. Our 2017 commencement speaker, Leana Wen, M.D., M.Sc., FAAEM, is currently the Commissioner of Health for the City of Baltimore. A critically-acclaimed author, Rhodes Scholar, and frequent TED talker, Dr. Wen is one of the nation’s leading patient and community health advocates. In her commencement address, Dr. Wen spoke about the pioneering work being done in integrative health, and encouraged our graduates to break down the walls of the exam room to understand the context of people’s lives and to treat the whole person. “Please continue to be the best practitioner that you can be, integrating science, cutting-edge treatments, and person- and family-centered care,” she said. “Our patients deserve no less.” Watch Dr. Wen’s address here. Student speaker Brian Dougherty, a new graduate of the Master of Acupuncture, shared his unique perspective on his path to becoming a healer at MUIH. He reflected, “We, even as recent graduates, even as ‘beginners’ still have our own instilled brilliance that has already begun to shine - and will continue to do so at greater degrees as we contribute our gifts.” Watch Brian’s address here. Read Brian’s full speech here. The annual Community Award honors graduating students who have provided extraordinary service to their class or to MUIH in one of more of the following ways: service to the learning of classmates or other students, service to the MUIH community, demonstration of leadership qualities, demonstration of commitment to being involved with furthering student life, and/or participation in activities on behalf of the school. The faculty in each program nominate and select the graduating students who best exemplify the qualities required to receive this award. The annual Great Esteem Award is awarded to faculty members in recognition for their outstanding commitment to students' excellence throughout their program of study, and it reflects the important qualities and virtues of an instructor who has made extraordinary contributions towards students’ learning. Students in each program nominate faculty members to receive this award. The annual Faculty Excellence in Innovation and Service Award acknowledges a faculty member who has demonstrated excellence in service to MUIH. The individual selected to receive this award exemplifies MUIH’s values with special distinction, and has shown innovation in their approach to meet a need within the MUIH or external community. The annual Excellence in Research and Scholarship Award acknowledges a faculty member for outstanding research and scholarship over the prior academic year. The recipient of the award has advanced the mission of the University through significant scholarly work in the area of integrative health. Read a recent interview with Dr. Tims and learn more about his innovative work here. All of us at MUIH are proud of our recent graduates and look forward to watching and supporting their work for many years to come. Congratulations Class of 2017!